In Australia, gambling is a way of life. It is estimated that over 80% of Australian adults gamble occasionally, and at least 70% do so at least once each year, rates that are unmatched by any other nation on Earth. Most of that gambling comes courtesy of pokies, as these machines are a ubiquitous part of our culture. Australians spend nearly AU$12 billion each year on poker machines, and while that number has dropped somewhat compared to a few years ago, there's nothing to suggest that gambling will stop being a major force any time soon – especially with the rise of online gambling, which becomes more popular every day. Unfortunately, while most Australians gamble casually, such high rates of gambling are bound to come with some cases of abuse. Problem gambling is a serious issue that can be destructive to individuals, families, and even communities. According to the Australian government, nearly one in six people who play pokies have some level of addiction, and up to 500,000 Australians either are problem gamblers or are at risk of falling into that category. 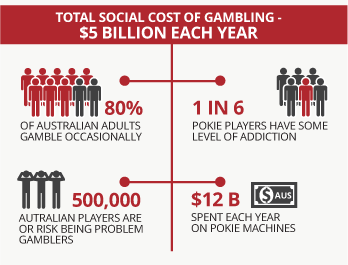 That's enough to make the total social cost of gambling close to AU$5 billion each year. 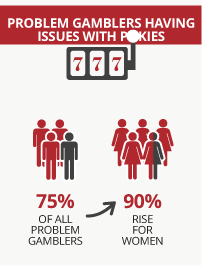 Problem gamblers are particularly likely to become addicted to poker machines. 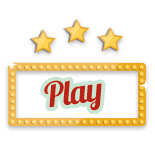 The combination of fast action and the potential for big payouts make them alluring to all players – that's why pokies are so popular – but that combination can be especially dangerous to someone at risk of developing a gambling problem. According to studies, about 75% of all problem gamblers cite pokies as a form of gambling they have had issues with; for women, that rate rises to 90%. If you or someone you know may have a gambling problem, there are many resources available to you to seek help. 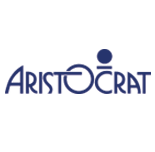 Some of these resources are available from the Australian government, while others are provided by casinos, clubs, or private organizations. Perhaps the top resource for problem gambling in Australia is www.problemgambling.gov.au . This website offers both resources and information on problem gambling for Australians, and can provide help not only for gamblers, but also for their friends and family. 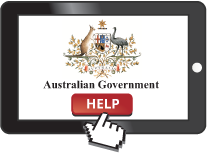 There are also links available to other resources, such as research data and the websites for problem gambling help in the state or territory you live in. Increasingly, clubs and casinos have offered more help to problem gamblers both of their own volition and thanks to new legislative efforts at the federal level. For instance, most clubs offer self-exclusion programs that will cause players to be turned away if they are spotted at any of the venues that have access to the same list. These can be great tools for players who wish to stop gambling, but find themselves giving in to urges – an especially common problem in the first few months of recovery. In recent months, poker machine reform has been a hot button political issue in Australia. The recent passage of reform legislation has put some additional tools on the table for Australians who feel they might be at risk of developing a gambling problem – though those tools might not be available for at least a few more years. Starting in 2018, larger clubs – those with more than 20 pokies – will be required to fit all of their pokies with voluntary pre-commitment technology, with smaller clubs having more time to fulfil that requirement. 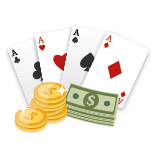 This technology will allow players to set loss limits that will prevent players from continuing to play on the machines should that limit be reached. This could potentially be a great tool for those who aren't yet compulsive gamblers, but realize that such a problem could develop if they were allowed to play pokies without limits. In the future, mandatory pre-commitment technology could be used on pokies throughout Australia, though this technology is currently only scheduled for a trial in the Australian Capitol Territory (ACT). 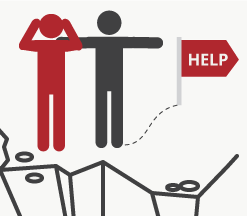 Helping a loved one with a gambling problem can be difficult. Broaching the subject with them might feel awkward, and they are likely to deny that they have a problem at all. Often, the best way to approach such a situation is to help educate the gambler about the issue, and see if they might recognize the problem if they better understand it. In some cases, an intervention might be appropriate, with family and friends gathering to share stories about how the gambler's problem has affected their relationships. While this is unlikely to change their behaviour, it may help them recognize the problem and seek professional help. 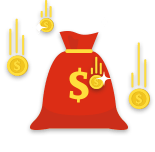 One important thing to remember is not to do anything that may seem helpful, but which will actually enable a loved one to continue gambling. For instance, when told that a relative has a gambling debt, it can be tempting to help them pay it off. However, there's a good chance that bailing them out will lead to them going back to their compulsive gambling again. Instead, it's more helpful to find ways for them to get financial counselling, which could help them recognize the problem and seek further help.